Core-Satellite approach in building stock market portfolio combines managing risk and return, experience and insight, and the reality of managing emotions such as greed and fear. Building stock market portfolio with core-satellite investment approach involves balancing risk and return, asset class by asset class, to meet investors risk/return profile. 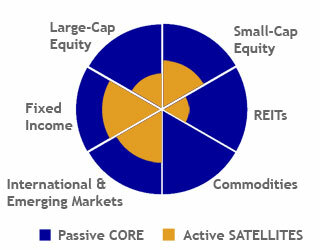 Core-Satellite builds on the concept of strategic asset allocation; it combines passive "core" investments thorough index funds and their clear benefits - lower cost, broader diversification, tax efficient and lowers volatility, with active "satellites" through actively managed funds or other direct investments offering potential for outperformance. Efficient portfolio theory hypothesizes that any portfolio along the curved line in the picture bellow represents a combination of assets that collectively offer the highest expected return for any given level of risk, or, the lowest risk for a given expected return. Building stock market portfolio with core-satellite investment approach may help increase a portfolio's expected returns while keeping risk constant, moving the portfolio closer to the efficient frontier, thereby attaining the best possible return for a particular risk tolerance. If any part of the portfolio is not meeting its target, remedial action can be taken swiftly without disturbing other elements of the strategy. This offers flexibility to the portfolio manager, and enhances transparency of risks taken and returns contribution. Core-Satellite investing is based on the simple concept of splitting a portfolio in two segments. The "core" represents the foundation of the strategy around which the more specialized satellite investments can be added. The core investments usually take the form of low risk and represent the main part of the overall stock market portfolio, typically 70%. 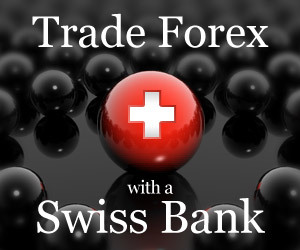 The aim is to deliver a return in line with the market's performance (beta return). Building stock market portfolio with core-satellite investment approach involves balancing risk and return, asset class by asset class, to meet investors risk/return profile. Satellites are typically more targeted part of stock market portfolio and are designed to outperform the core portfolio. These investments are chosen by the investor in the expectation they will provide additional returns (or alpha) above the market returns of the strategic asset allocation. Satellite investments typically carry higher risk and fees than core investments. Unlike traditional investment strategies, which rely exclusively on actively managed products as both the core and satellite, today's core-satellite models combine index and active investments across asset classes - creating a balance between a strong foundations based on diversified asset allocation and opportunities for risk-controlled, enhanced performance. 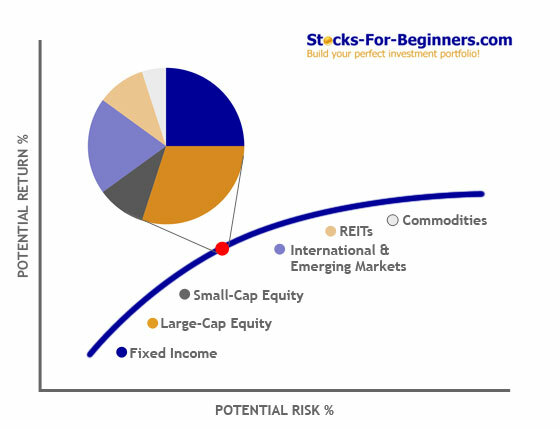 Market timing and security selection may provide some short-term gains at times; however over the long term research studies have proven that asset allocation is by far the greatest determinant of portfolio outcomes; according to some studies asset allocation presents 94% of the variation in returns in a portfolio. Security selection and market timing only have minor influence, particularly over the long term (only 6% of the variation in returns in a portfolio). The core-satellite concept recognizes the fundamental differences between index and active fund management and blends the best aspects of both approaches. The primary aim for an index fund is to achieve market performance (beta) at a low cost to an investor. Index funds achieve this by holding a broad spread of securities within an index in order to track the overall performance of the index. An index fund does not require the same level of research and security analysis that active management requires (at substantial cost) and will tend to buy and hold these securities with very low levels of portfolio turnover. Lower portfolio turnover results in lower fees to the investor and generally more favorable tax outcomes. The primary aim of an active fund is to seek outperformance of the index (alpha) through security selection and/ or market timing. In contrast to index funds, active funds often hold a smaller number of securities. Active funds require more initial and ongoing analysis and rely more heavily on the skill of individual portfolio managers to pick the right stocks. Active managers come with varying styles and themes from thematic to top down, value and growth, large or small cap biases etc. Active funds as the name suggests, have a tendency to transact more often, resulting in higher portfolio turnover, which may lead to higher realized tax gains and higher costs to the investor in pursuit of expected returns. Core-satellite delivers the best of both worlds. Using index funds as the "core" of your portfolio, indexing gives an investor a low cost, more tax effective and diversified portfolio, while carefully selected lowly correlated actively managed "satellites" can complement the core by giving potential to outperform the market. Management fees - index funds have lower ongoing fees than most active funds investing in similar assets. In other words, it costs less to manage and operate an index fund compared to an actively managed fund. Transaction costs - index funds generally have lower portfolio turnover than most active funds, resulting in lower ongoing trading costs. Funds which have a high level of portfolio turnover generally create greater capital gains tax liabilities for investors than funds with low turnover. Generally, the lower the portfolio turnover, the more tax efficient the portfolio will be. If individual securities in a fund are held for longer than 12 months they become eligible for a 50% capital gains discount on disposal, resulting in greater tax efficiency. Index funds tend to have low portfolio turnover due to their "buy and hold" strategy. This reduces realized capital gains tax on which tax is payable, which maximizes the compounding effect of having your money work harder for you over the long term. Indexing aims to deliver competitive long-term investment results at low cost. Historically, few active managers have been able to sustain consistent above index returns after costs and tax over the long term. Broad portfolio diversification means less exposure to the performance fluctuations of individual shares or securities. The overall effect is to moderate the volatility of a portfolio and "smooth out" investment returns over time. Index funds invest in a wide selection of securities in the relevant index therefore minimizing stock specific risk. By reducing the dependence on key individuals an index process delivers a greater certainty of ongoing outcomes and greater stability of results.